Seven Guns Press, 9780988425903, 196pp. Orphan Jack Templar has no memory of his parents and only the smallest details from his Aunt Sophie about how they died. The day before Jack's fourteenth birthday, things start to change for him. At first it's great: A sudden new strength helps him defend his nose-picking friend "T-Rex" from the school bully, and even his crush, Cindy Adams, takes notice. But then a mysterious girl named Eva arrives and tells him two facts that will change his life forever. First, that he's the descendent of a long line of monster hunters and he's destined to be in the family business. Second, that there's a truce between man and monster that children are off-limits...until their fourteenth birthday Jack has only one day before hundreds of monsters will descend on his little town of Sunnyvale and try to kill him. As if that weren't enough, things get even more complicated when Jack discovers that the Lord of the Creach (as the monsters are collectively known) holds a personal grudge against him and will do anything to see that Jack has a slow and painful death. To stay alive and save his friends, Jack will have to battle werewolves, vampires, harpies, trolls, zombies and more. But perhaps the most dangerous thing he must face is the truth about his past. Why do the other hunters call him the last Templar? Why do they whisper that he may be the "One?" Why do the monsters want him dead so badly? Even as these questions plague him, he quickly discovers survival is his new full-time job and that in the world of monster hunters, nothing is really what it seems. 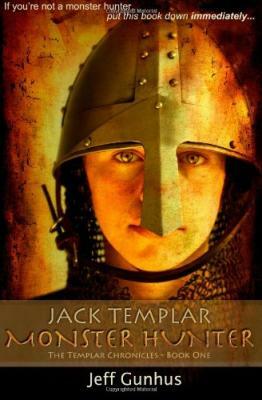 The added fun of Jack Templar is that readers are warned that reading the book will attract the attention of monsters in their area. They are told to read on only if they are ready to enter the dangerous world of monsters and hunters as an active participant. After all, the best way to get a young reader to do something...is warn them not to do it For Middle Grade readers and higher Fans of: Percy Jackson, Harry Potter and The Goosebumps Series by R.L. Stine.